For most people, barbecue isn't barbecue without smoky pork spare ribs on the menu. And it's no wonder why. The flavor can be out of this world when spareribs are seasoned up, hickory smoked, then slathered with a rich sauce. 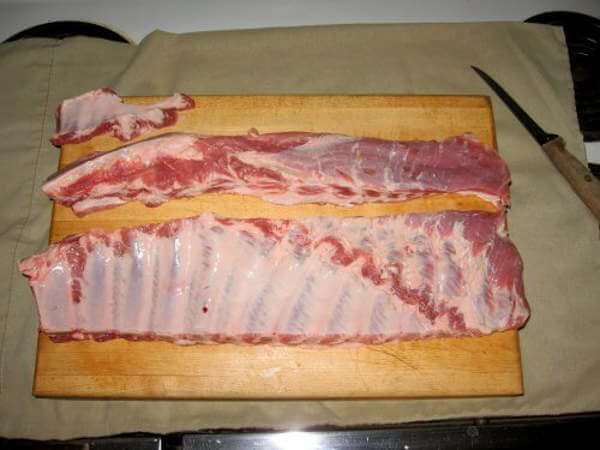 Pork spare ribs are one of the fattier cuts of meat from the hog, and contain more bone than meat. Slow smoking melts the fat, and transforms the slab into excellent eating. 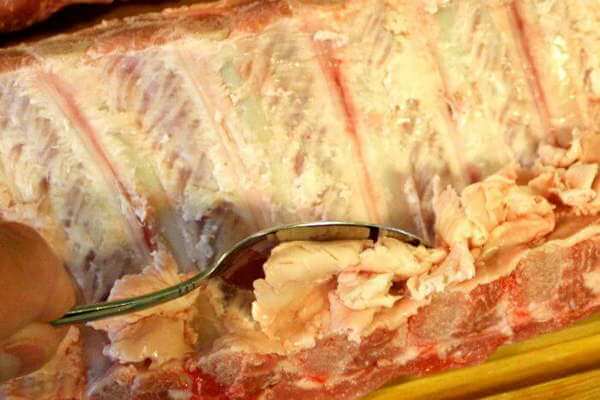 A whole sparerib slab is made up of several parts, including the ribs, the sternum, the cartilage (or brisket), the point, the skirt, and the fell. Ribs. The rib bones are from the lower half of the rib cage of the hog. Sternum (or breastbone). The sternum is on the edge opposite the cut rib bone ends, and runs parallel to its length. It's about five inches long and is on the wide end of the slab. Cartilage. The cartilage is on the same edge of the slab as the sternum, and connects to the ends of the rib bones. This is also known as either the brisket or the rib tips. Point. 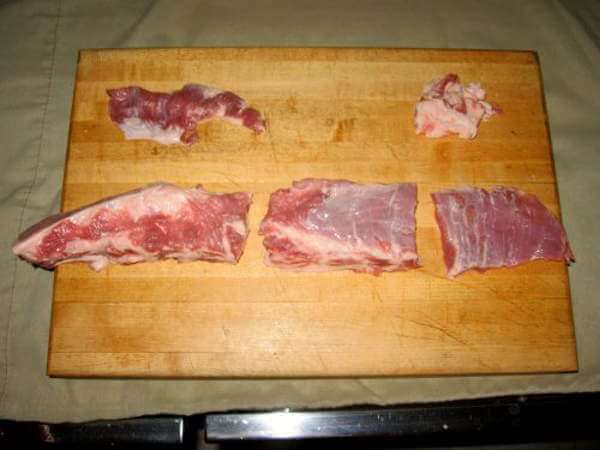 This is the boneless triangle of meat at the narrow end of the slab. Skirt. The skirt is a flap of meat-covered membrane on the bone side of the slab, and is what is left of the diaghram of the hog. Fell. 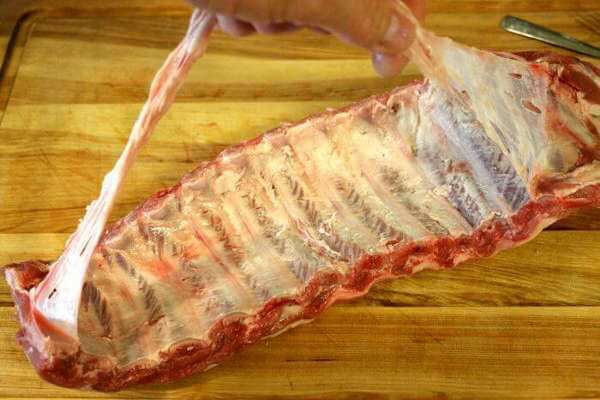 This is a thin, tough membrane that covers the bone side of the spareribs. Left on, it prevents seasonings and smoke from reaching the meat. The whole pork spare rib slab can be cooked as-is, but for more even cooking and a nicer looking presentation, it should be trimmed. The sternum and the cartilage are trimmed off with one cut. Start at the wide end of the slab, removing the sternum. Continue the cut, removing the cartilage ends from the ribs. The point can be cut off, or left on. I usually cut it off, since it cooks quicker than the ribs (and it makes a good snack!). Trim it off about a half-inch from the side of the shortest rib. Remove the skirt next. 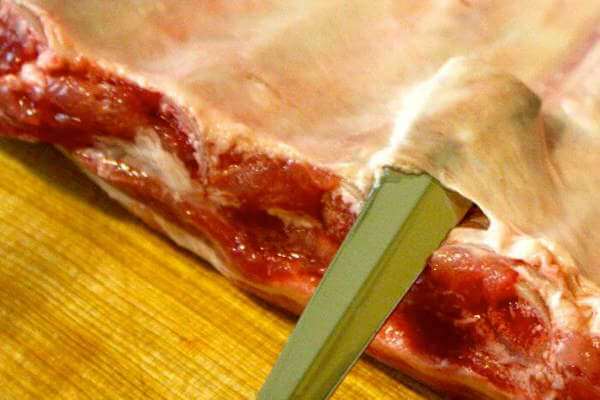 Lay the knife flat against the rib bones and trim it off. This piece makes for a quick cooking snack, too. To remove the fell, slip a screwdriver or a butter knife under it at one end of the slab and pry loose a flap. Grip it tightly using a paper towel, and slowly peel the membrane off. If you're lucky, it will come off in one piece. If the membrane tears, don't despair. Pull out your screwdriver, free another flap, and peel until it's all gone. 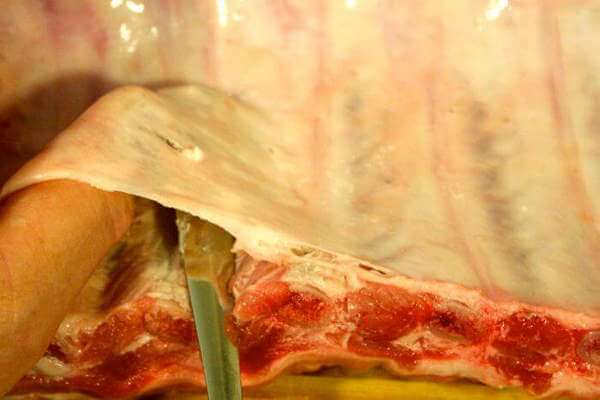 One last step is to remove any large deposits of fat from the ribs. Clean both sides, and don't worry too much about smaller pieces. They'll melt off during smoking. That's it! Your whole pork spare ribs slab has been transformed into a Kansas City style rack. It looks good, fits the smoker better, and will cook evenly. Spare ribs can be marinated, seasoned with dry rub, or both. I normally just use dry seasonings on spare ribs, unless I'm looking for a unique flavor. A marinade typically contains flavorings, oil, and an acid of some kind, like vinegar, wine, or fruit juice. Marinate ribs at least one hour. For a more intense flavor, leave them in longer, up to overnight. 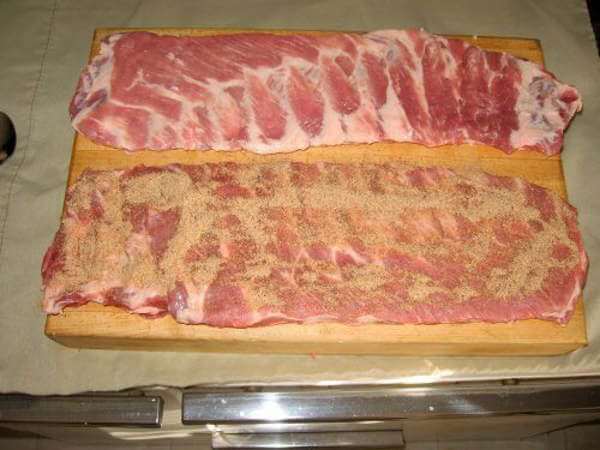 Rib rubs shouldn't contain a lot of salt, especially if the ribs being smoked have been enhanced with brine. Spices, herbs, and maybe a bit of sugar should make up the majority of the rib rub team, with added salt being a minor player. A light coating of rub is usually all that's needed. See The Spare Ribs In The Back Of This Smoker? Salmon Looks Good Too! 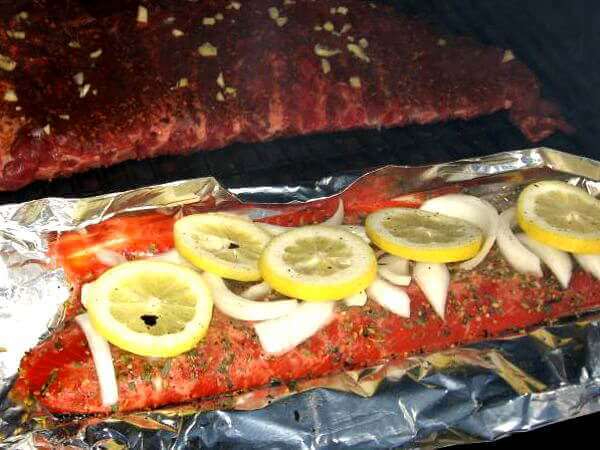 The smoker temperature should be within the 225-250 degree Fahrenheit range. Hickory smoke is the traditional choice, but oak, pecan and apple are all fine. Place the ribs into the preheated smoker, bone side down, for two hours. After that time, flip them over and continue smoking them for one more hour. 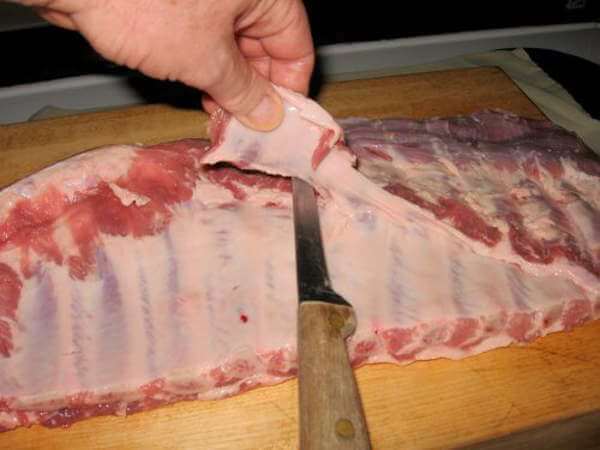 To test for doneness, grip two side-by-side ribs and pull them apart. The meat should separate, but not too easily, when they are done. Make sure to check each rack, since cooking time can vary from slab to slab...even if they are identical sizes. If you like, you can put barbecue sauce on the slabs while they're still in the smoker, but only during the last half hour. A sweet barbecue sauce can burn rather easily. When the pork spare ribs come out of the smoker, cover them with a tent of aluminum foil and allow them to rest for 20 to 30 minutes. During this time the juices will redistribute evenly through the meat. 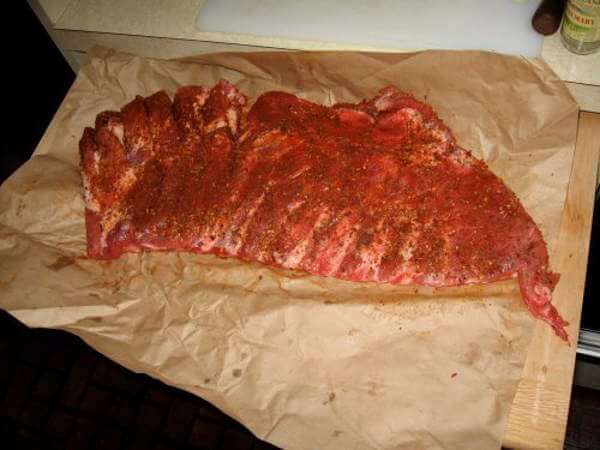 Cut the slabs into individual ribs, and serve them with french fries, smoked beans, coleslaw, and extra barbecue sauce. And plenty of napkins...this final step can get pretty messy!